From Wells Commercial Cooking Equipment - Food Warmer, top-mount, built-in, electric, - 5 - 12" x 20" openings, wet/dry operation, thermostatic controls, s/s interior, insulated aluminized steel housing, 208/240v, 3ph - 1ph - , 1240/1650w per well, UL listed - Your Source for Quality Restaurant Equipment and Supplies. 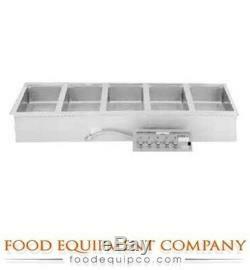 Wells Food Warmer top-mount(5) MOD-500T. The item "Wells MOD-500T Food Warmer top-mount built-in electric (5) 12 x 20 openings" is in sale since Friday, December 2, 2016. This item is in the category "Business & Industrial\Restaurant & Food Service\Tabletop & Serving\Serving, Buffet & Catering\Buffet Tables & Salad Bars". The seller is "restauranttory" and is located in Pottstown, Pennsylvania. This item can be shipped to United States.